To find used cars and trucks by owner you can either use the search box here on the home page or use the navigation links provided at the top of the page through-out the website. We break down what each option does below. You may enter any or all of the fields in the used car search box. If you enter only the Make of a vehicle you will be taken to a page which displays all of the used cars, trucks, SUVs and vans available from that manufacturer. If you select both make and model we will take you directly to the used car information page where you can see information about the vehicle and search for sale by owner listings by entering your zip/postal code. If you would like to browse our FSBO listings in your area, simply supply your zip/postal code and clicking "Find It"; you will be taken to a page which will display all of the used cars and trucks for sale by owner in your local area. This menu option will help you rapidly find used cars and trucks for sale by owner. By selecting this menu option you will have access to the newest used car listings on our site. If you would prefer to browse our classifieds by body style e.g. ( convertibles, trucks, or vans ) or by the category of a vehicle ( compact cars, sports cars, SUV & crossovers, or full size trucks ) then we make that easy for you by selecting the "Search Inventory" menu item above and then clicking "By Category". If you know the brand of vehicle you would like to purchase you can use the same mechanism, but select the "By Make" option. If you would rather search our classifieds by state or province you can select those options as well. The small flags in the upper right hand corner of each page will send you directly to used cars by owner here in the United States or to private owner classifieds in Canada. 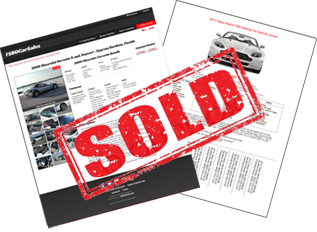 FSBOCarSales gives you everything you need to sell your car online quickly. If this is your first time buying or selling a car from a private party we can help! We have created a short guide which will help you navigate the potential pitfalls of selling a used car or truck yourself. When you're ready to post your online classified we make the process simple. Our smart forms help you fill in the basic features of your vehicle and our image upload process allows you to upload all of your images in one step. Our website and ad submission processes are 100% mobile friendly, so once you have your old car cleaned up you can create your online ad and upload all of your images from your driveway! Notable features included with your free used car classified: Runs until it sells, Add up to 19 pictures, Nationwide in Canada & the US, FSBO flyer, Print a bill of sale, sell multiple vehicles at the same time, we keep your personal information completely private.